A new cricket prodigy making headlines from the valley of Kashmir, Rasikh Salam Dar, is expected to make it big in IPL 2019 auction, with the Rohit Sharma-led Mumbai Indians most likely to try and avail his services for the upcoming season. 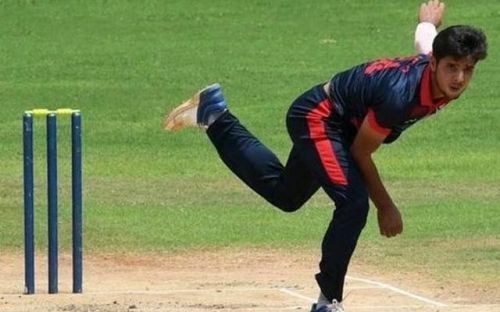 Coming from Kulgam district of South Kashmir, the 17-year-old seamer was called for trials by the Mumbai-based franchise soon after the conclusion of Vijay Hazare Trophy, where he showed glimpses of his distinctive bowling skills. Following that, he was recently nominated among the 346 players who will undergo the hammer at the auction. The teenager, despite having no past experience of junior-level cricket, has already gained himself a name in the domestic cricket arena and could well fetch a healthy IPL contract. Mumbai Indians, who released six bowlers including three each Indian and overseas players in the first trade window, would surely like to insert him to strengthen their bowling department. Rasikh's good outing in the Mumbai Indians trials adds to his possibility of playing for the team in IPL 2019. "Rasikh had bowled exceptionally well in the trials and there are high possibilities of Mumbai Indians buying him at the auction," a top source in JKCA told Sportskeeda exclusively. According to the official source, the skiddy seamer had passed both the rounds of trials and left a strong impression to selectors. "You're given a match like situation in these type of trials and if you pass one, you enter the next round. Thankfully, he (Rasikh) had earned selectors' praise in both the rounds," the source added. "A player, at a such young age, getting an IPL contract would be a miracle in itself. Our youngsters will surely get inspired," a former J&K cricketer told Sportskeeda. Meanwhile, Indian all-rounder, Irfan Pathan who actually identified Rasikh's skills initially, also believes that Salam is going to make it big as he already bowls around 130-35km/h. “He’s basically an in-swing bowler though he can make the ball deviate. That’s why gets the caught-behinds. He runs in well, and he’s very wiry which is what impressed me. I’m sure he’s going to be one to watch out for if he keeps his head down and works hard. Now he bowls at 130-plus. "He’ll get quicker with more training and develop his bowling muscles. He’s got a fantastic slower one too,” Pathan was quoted as saying to Mumbai Mirror some days back. Rasikh Salam's brilliant run in the ongoing Cooch Behar U-19 tournament also makes him a top contender. He has scalped 15 wickets including 13 bowled out in the four matches.